I was reading through the latest magazine, looking at all the things I cannot afford and doing the crossword (I try not to cheat, and completed it successfully). I was going through some old material I had written quite a long time ago (I authored a book at about the same time), and came across something I had written, more for myself than anyone else, about the more challenging side of caravanning. The wife and I are getting on now, and have advertised our Gypsey Royale for sale, but after a few weeks, we decided we missed it too much and are thinking of bringing it back from the people who are trying to sell it for us. Thanks for a good mag. When we have finished, we pass it on to a fellow caravanner who goes out a great deal (retired, and somewhat better off than me), and when he has finished it, he leaves in in the facilities of one of the parks he is visiting, so it does the rounds. Keep up the good work. 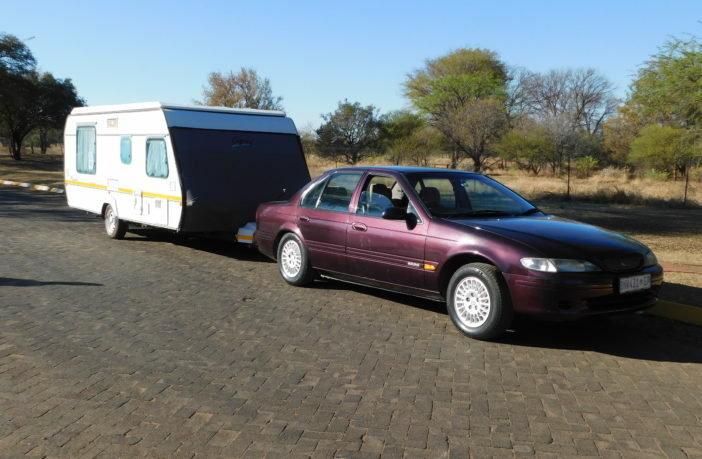 Setting out from home for our extended trip from Kensington in Johannesburg to Cape Town with the trusty Ford Fairmont, towing our Gypsey Royale, was an exciting affair. The caravan is equipped to make it a comfortable “home away from home”, including a microwave, refrigerator, double bed, toilet and hot and cold running water on board. Getting out of Johannesburg is always a trial, as the other road users seem to think that everyone should be doing 120 km/h, even if your rig is about 11 metres long, and a comfortable cruising speed is about 90 km/h. Once we had negotiated the congested local roads, we settled down to our normal cruising speed on the road to Bloemfontein, heading for an overnight stop. An uneventful stage of the journey, and the overnight stop was also routine, except there was a party going on in the conference hall, and at 10pm I suggested to the security office that he might ask the revellers if they would like me to “fix” their music system. It soon quietened down, and we left the next morning after a light breakfast, for our next destination. All went well until we were approaching Middelburg, where road works had reduced the width of our lane to a degree that my left wheels were in the gravel and potholes. As we reached the far side of Middelburg, a couple of vehicles in our vicinity hooted as they passed us, and my wife told me to pull over. Indeed, the left wheel of the caravan was decidedly less healthy than the other side. With a few unkind words I extracted the necessary implements from beneath the pile of luggage in the boot, and set about replacing the tyre. By pure good fortune, when we purchased our caravan, we discovered that the spare for my Ford Fairmont fitted on the caravan. 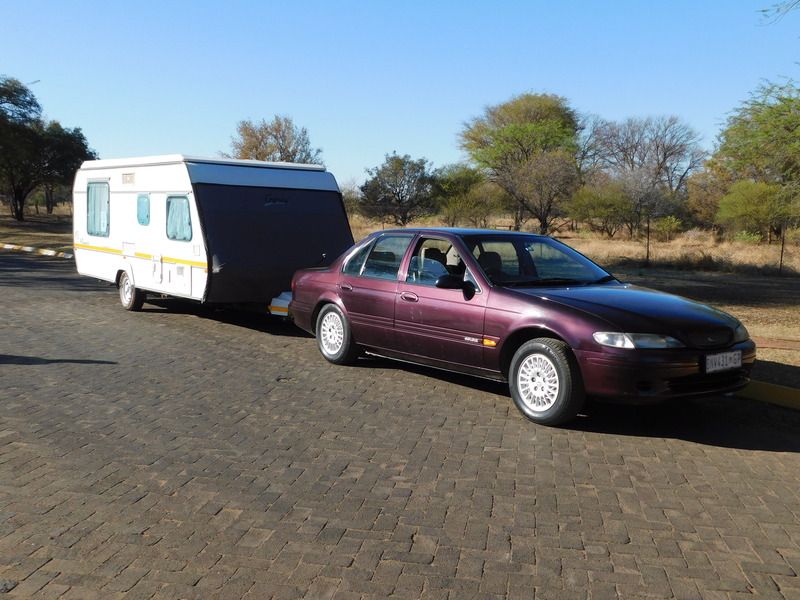 Wheel changed, we head off to Middelburg to have the tyre repaired, but on the first gentle bend I heard a loud bang and the caravan lurched to the left. In my rearview mirror, I saw my spare wheel heading off into the veld. I pulled the vehicles as far off the road as I could, and the wife headed off to look for the wheel. Evaluating the damage, I used up my vocabulary of not-so-nice words, but could not explain the reason for the incident that left the side of my caravan quite badly damaged. I am normally meticulous about refitting tyres, and was sure I had secured the wheel correctly. A vehicle approached and an elderly gentleman, accompanied by a younger woman, pulled up across the road, introduced himself and showed me where the wheel had gone – not far from where I was standing. By now my wife was pretty well out of sight. The younger lady, the driver’s daughter, took off after my wife who had walked nearly a kilometre to look for the wheel. It was clear that the tyre had sustained considerable damage, and so we were left with no option but to buy another one. I was about to unhook the caravan, now stuck in the middle of the road, and drive into Middelburg, when my Good Samaritan insisted on driving my wife into the town to purchase a new tyre. I had also spotted the problem: the bolts holding the left hand wheel were shorter than those on the right, and did not secure the Fairmont spare securely enough. Once the wife and our helper returned – having paid an exorbitant price for a tyre – it was a matter of minutes to replace the wheel, with the longer bolts obtained, tie the steadying leg at the back of the caravan up so that it did not drag on the ground, and set off again. Needless to say, the mood aboard the Ford was not happy. We eventually reached our destination as it was getting quite late, and the heavy drizzle did not help to lighten the mood. We asked for directions to the caravan park, and were assured that it was “just up the road”. Some two kilometres up a decidedly dodgy untarred road, we saw a dilapidated sign that indicated some sort of facility. I drove on to discover an old, deserted site. My language warmed the decidedly cool air, it was drizzling. Three ladies came jogging down the road, all three wearing wet T-shirts with no apparent additional support beneath. I leapt into the road, as I wanted to ask directions (my wife still does not believe I that I could move so quickly) and questioned them about the whereabouts of the caravan park. We found out the we needed to go along the road , through a drift, up a steep hill up to the top, and were warned to be careful as there was a leopard in the area that had just produced two kittens, close to the park. I now had to get an 11-metre rig out of an impossible turn, so we had to go back along the road to the little parking lot. It took numerous forward and back convolutions to get onto the road in the right direction. The “caravan park” was at the top of a steep hill, with a site that could have qualified as a BMX challenge run. The first site we found had a power supply that was in pieces, so we decided to move. The steep hill to the top section defeated the efforts of the Fairmont to get enough grip to ascend, and we had to roll back several times to try again. It was only after four tries that I noticed the caravan was edging nearer and nearer to a steep slope that headed down to the river. I put chocks behind the wheels and with a great deal of grunting and straining, we finally got the caravan to a sort of level site, and plugged in the power. I heard a yell from my wife, telling me that the frame of the door had given her a shock, so I tried one of the other plug points, which, fortunately, actually worked. While I was settling my nerves, and the van, the attendant wandered over from the office to collect our fee, which I paid with considerable reluctance. By now it was completely dark. After a restless night, a sort of shower (the shower head had seen better days), and a brief visit to the toilet, we fled to town and made a note in our log that this would not go onto a bucket list of places we would like to visit again. The trip to Jeffrey’s Bay was uneventful, and we spent a pleasant evening watching the dolphins playing in the waves just offshore. The damaged side of the caravan that had suffered under the attack of the errant wheel was slightly hidden by placing a folding chair in front of it. Our journey continued to Cape Town, where we arrived somewhat stirred but not shaken, determined to enjoy our holiday, despite the alarums and excursions of the journey.